are a million tutorials out there for Wonky Log Cabin Blocks. I'm just going to share my method for getting down and dirty with your scraps. I'm also aware that my blocks are not "true" log cabin style blocks. I'm going for a loose interpretation, but the general idea is the same. 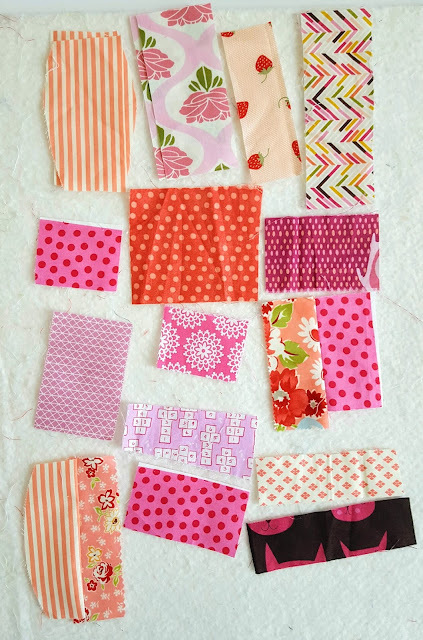 First off, I organize my scraps by color. I keep them in these clear plastic shoe boxes from Wal-Mart ($1). This make it easy for me to see what I actually have, besides making my shelves look pretty. These bins contain my string-like scraps -- long skinny pieces I've saved from the trash can. I lay my scraps in the bin nice and flat so I don't have to iron them when I use them. (no reason to add extra work) Once a color bin is overflowing it's time to tackle the scraps! Step one is to DUMP the bin on the floor! 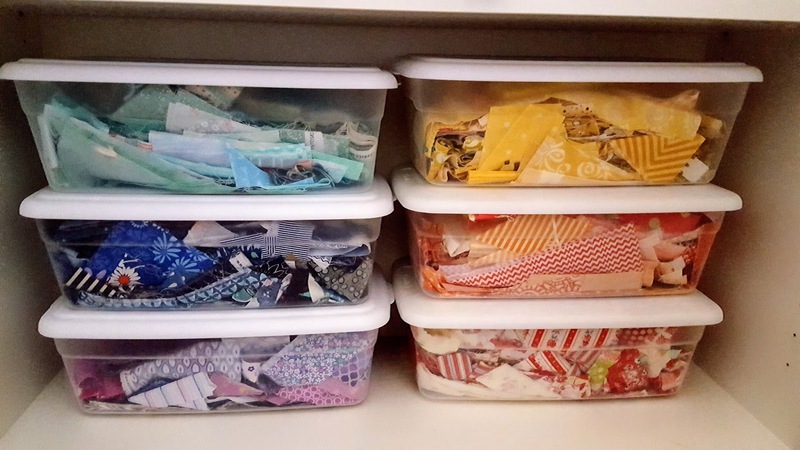 The dump method makes it easier to see what you have while sewing and sorting. Once you've dumped your scraps it's time to do a quick sort. 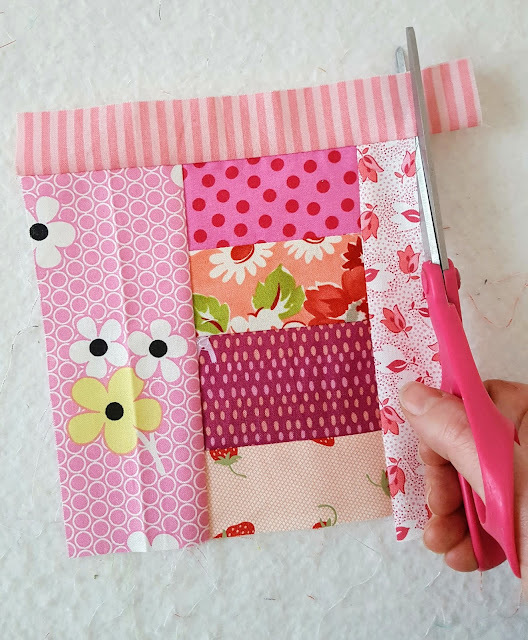 Pull out scraps and sort them into equal lengths. But if you spend more than 5 minutes doing this, you are taking too long! You don't need to sort the whole bin, just enough to get you started. Pull out the smallest scraps first. Mine are about 1.5" wide by 2" long, but just use whatever you have. These will be the start of your blocks. Once you have done that, chain piece them into pairs fast and furiously. These are now your block centers. Then it's time to iron. Next, lay your newly ironed pairs out on your design board, dig thru your scraps for more small scraps, add them to each pair, and sew like the wind! Remember, you are trying not to trim so find similar sized pieces. 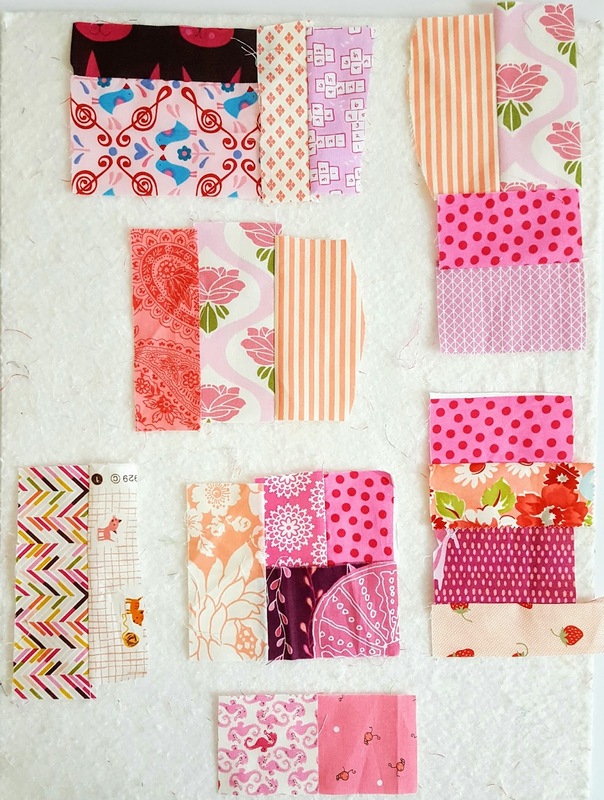 This picture shows how I've matched up scraps as I've added on. 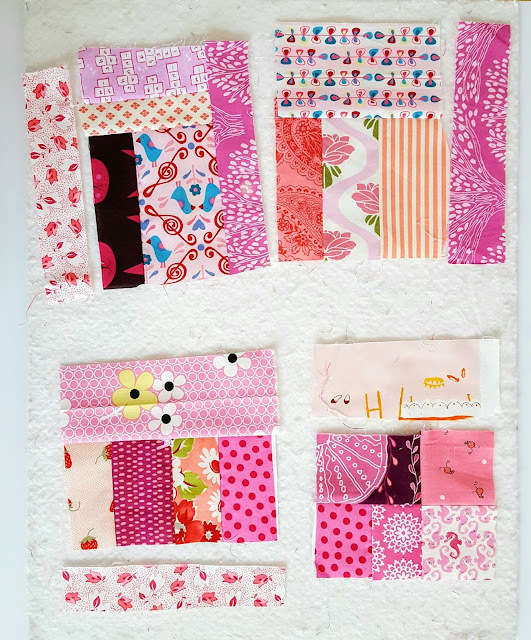 Sometimes I'll combine my initial pairs together (like the block in the upper right corner) and sometimes I'll add a new scraps, always letting the size dictate it's placement. 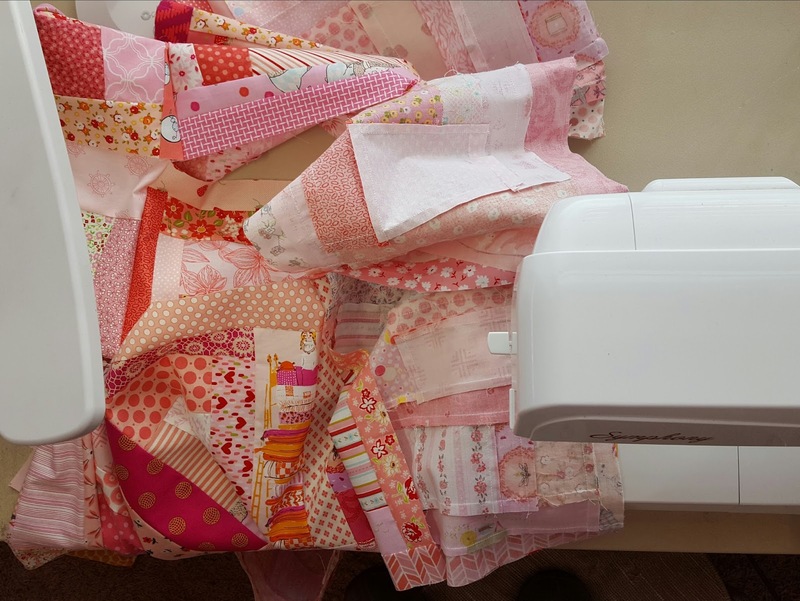 Once you are done sewing on a new scrap to your blocks, take them back to the ironing board, iron, find a scrap that is the right size, sew, and REPEAT. Over and Over and Over... I can't stress enough that chain piecing will be your best friend! 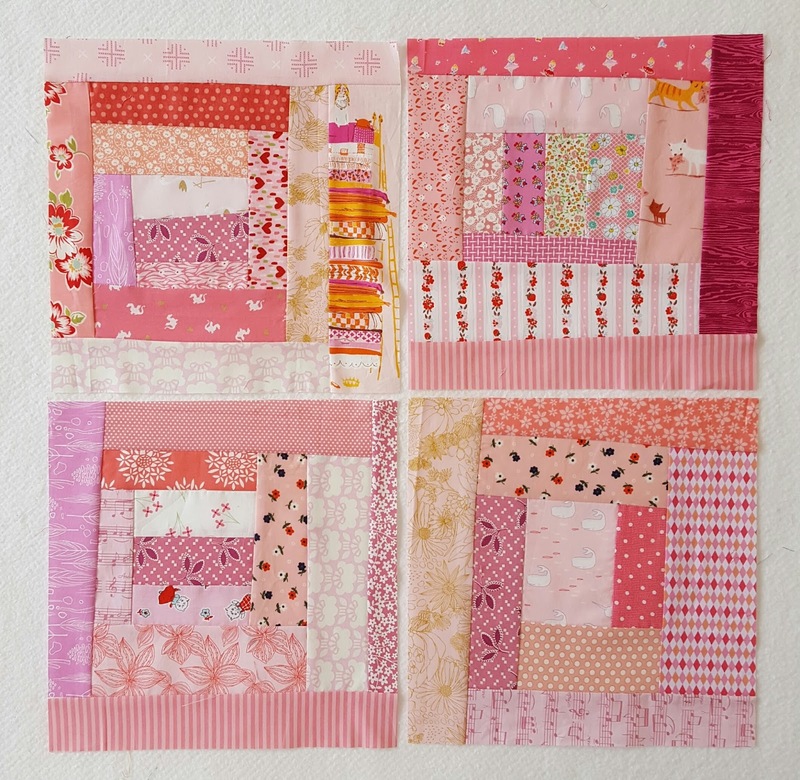 The goal is to mix up the placement of lights and darks in your block to create more depth and dimension in the quilt. If you put scraps that are too close in value together it will create less dimension. But again, the idea is not to think too hard. That's why making multiple blocks at a time is so helpful. If a scrap doesn't work for one block it will likely work in another. And, because my fabric is all over the floor I can sort and find the length I need easily for each block without much effort. Once the blocks get to a certain point I will need to start cutting strips to length. But I use my scissors. Again, fast and furious (down and dirty) is the name of the game. No need for a rotary cutter at this point. You can see on the back of my block that not everything is perfectly trimmed. I'm totally ok with that because it's so minimal. And no one looks at the back. Let me stress again, that the only trimming I've done at this point is cutting off super long ends with scissors. The rest of the scrap is used as is. That is how it becomes wonky! 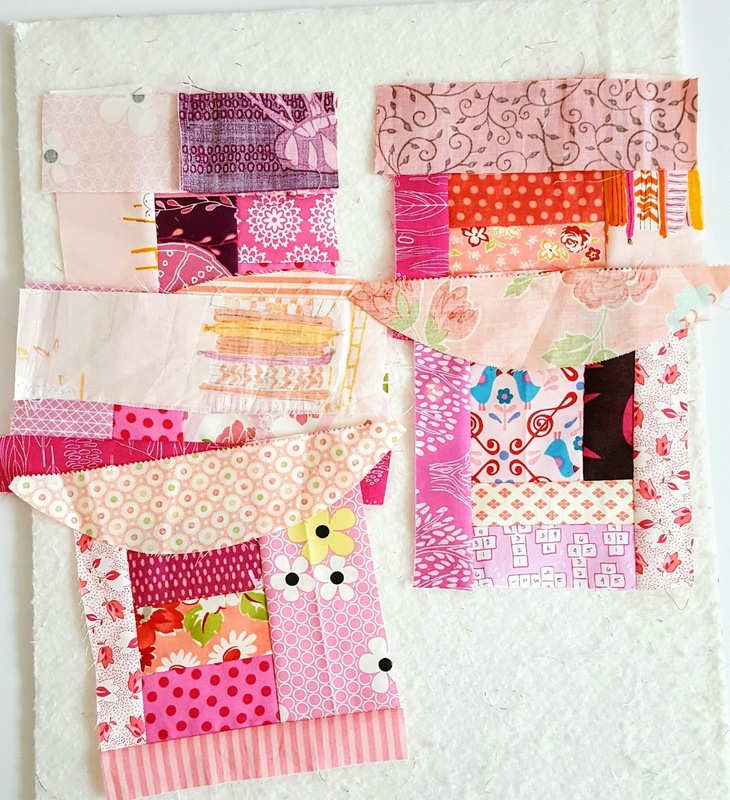 Once you get into a rhythm you can bust out blocks pretty quickly and tear thru your scraps fast. 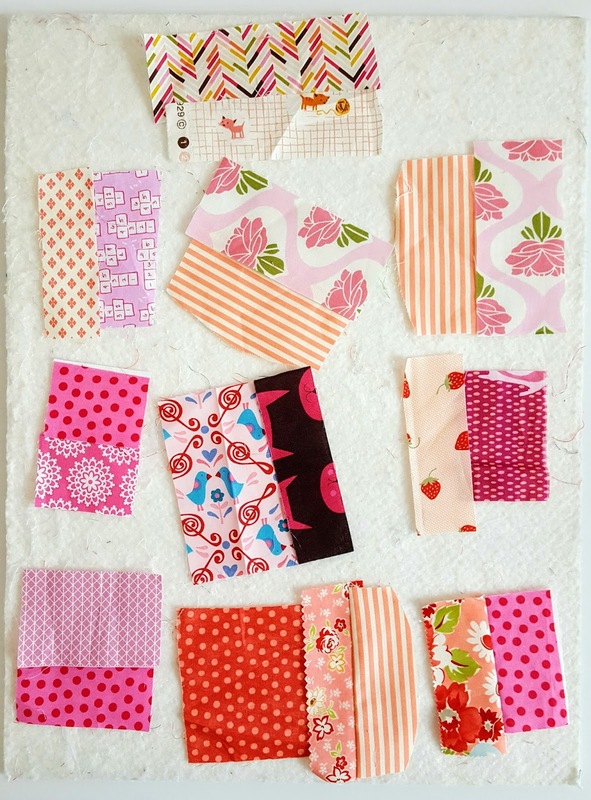 Find a scrap, sew, iron, repeat! Easy as that! 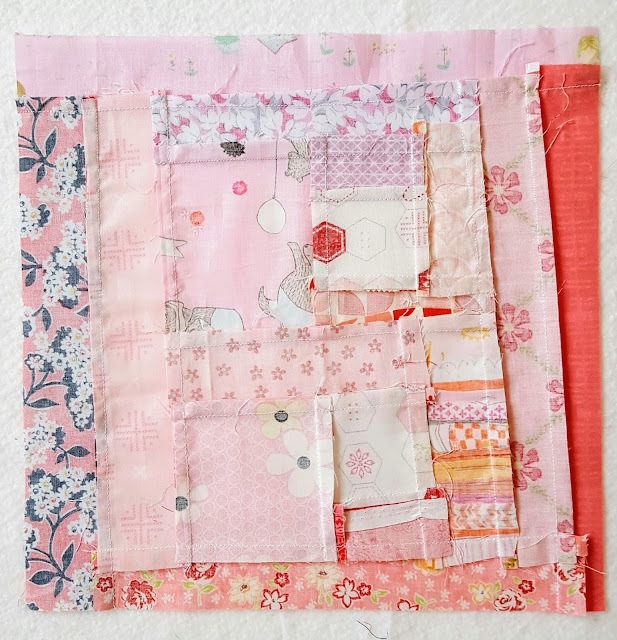 Once your block is BIG, square it up to 12.5". If your block isn't wonky enough, this is when you can add some extra tilt. 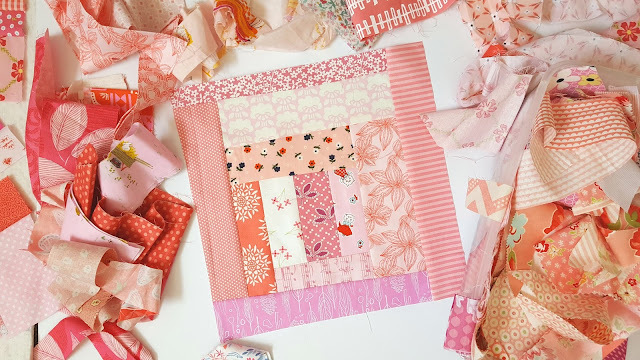 Up close your blocks might be a bit crazy, but once you step back and look at the whole picture (as I like to call it... using the "Galloping Horse" Method) you'll enjoy great dimension in your quilt. 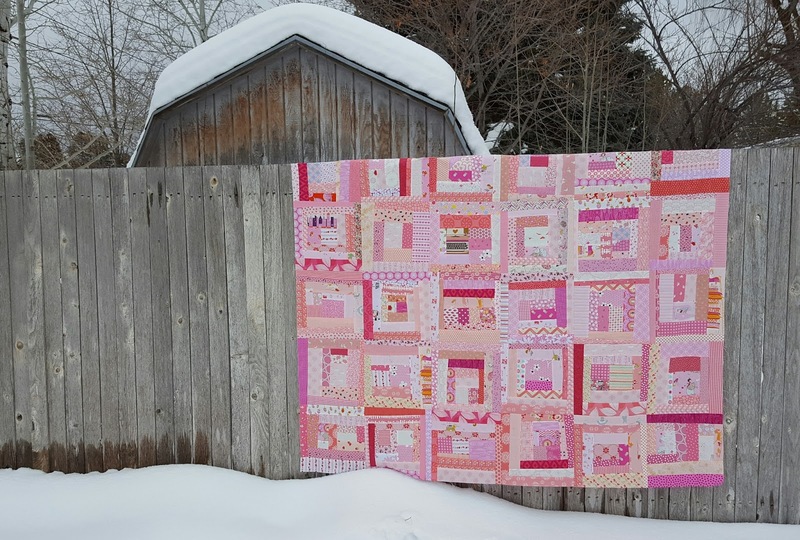 When you are done you'll end up with a beautiful quilt! The idea is to have fun, work fast, and don't over think it! P.S. I like to think of this kind of quilt as being a "FREE" quilt, since the scraps could have easily been thrown away. This is really beautiful! Thank you so much for sharing your method. This sounds like the perfect way to use up my scraps and get back to a manageable bin. Also, the freedom to just sew without precision is VERY appealing. 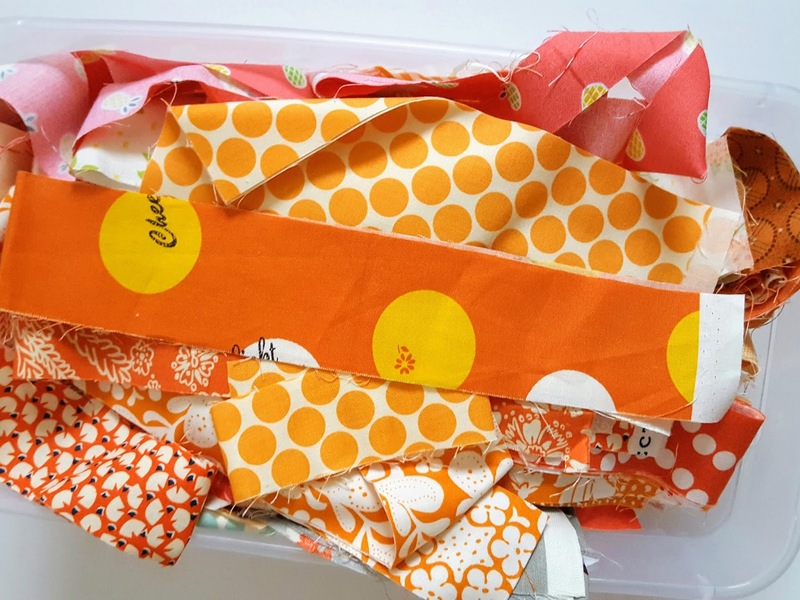 I can hardly wait to sort my scraps! This is awesome! 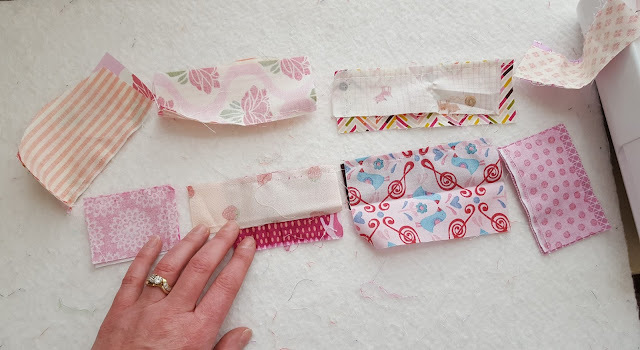 I have so many scraps waiting for this technique. Thanks for sharing.